Nothing is quite what it seems on Unaka Mountain. 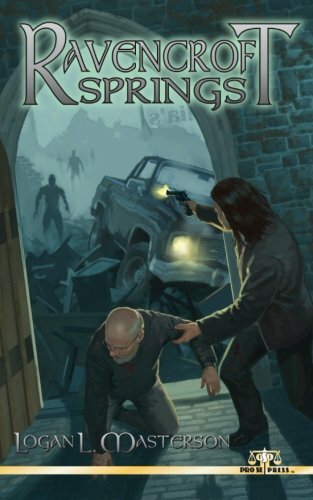 And Pro Se Productions invites you on a Lovecraftian thrill ride to find out for yourself in RAVENCROFT SPRINGS by Logan L. Masterson, the latest novel to debut from the cutting edge publisher of Genre Fiction. RAVENCROFT SPRINGS tells the tale of David Dunbarton, a man in need of a change. Following the unexpected success of his first novel and subsequent destruction of his marriage, David wanted somewhere nice and quiet to settle down. He wanted to surround himself with art, not people, and just maybe get to work on his next book. To that end, Dunbarton finds himself on Unaka Mountain and in the town of Ravencroft Springs. The abandoned hotels and homes of Ravencroft Springs decay in silent dignity. When Dunbarton relocates in hopes of breathing life into the town and himself, the mysterious village draws him in, leading him down mist laden streets where he finds arcane secrets and bizarre townsfolk. Leading him ever closer to the Secret of Unaka. Featuring a fantastic cover by Adam Shaw with logo and print design by Percival Constantine, RAVENCROFT SPRINGS is now available via Amazon and Pro Se’s own store athttp://tinyurl.com/p7uzk7n for $9.00. The new digest novel is also available as an Ebook with formatting and design by Russ Anderson at Amazon, Barnes & Noble, andwww.smashwords.com for $2.99. Pro Se Productions presents RAVENCROFT SPRINGS by Logan L. Masterson. A Lovecraftian tale of suspense set in the ancient Appalachian Mountains of East Tennessee, Ravencroft Springs is also a tale of desperate love and unrequited fate, both monstrous and moving all at once. RAVENCROFT SPRINGS by Logan L. Masterson. From Pro Se Productions. For more information on Pro Se Productions, go towww.prose-press.com. Like Pro Se on Facebook atwww.facebook.com/ProSeProductions.